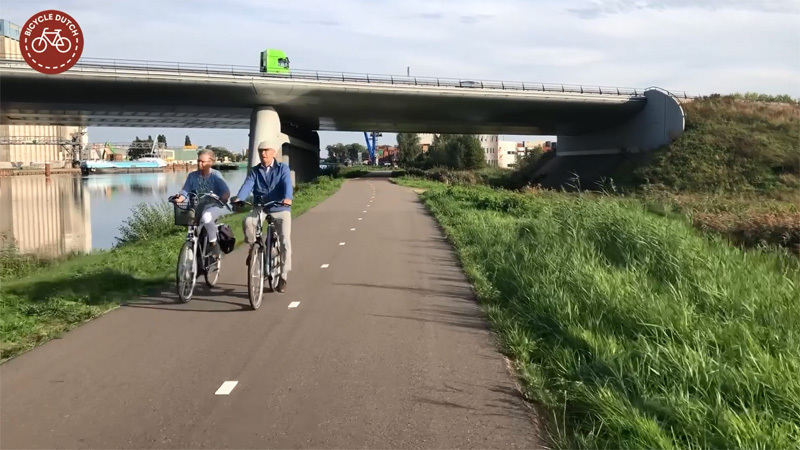 Although we try to separate the routes for motor traffic and cycling as much as possible in the Netherlands, combining other types of infrastructure is often a good idea. 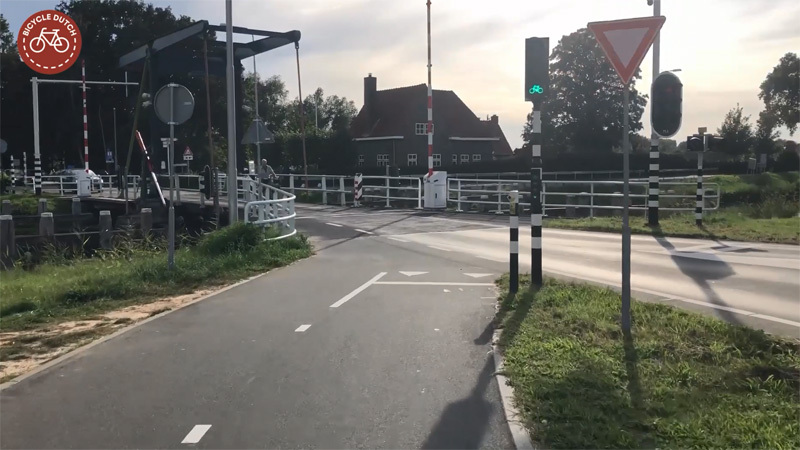 On this blog I’ve shown you some examples already; main cycle routes following a railroad, a bicycle bridge attached to a railway bridge and two cycle routes alongside a canal. These two routes have been connected for a few years already. 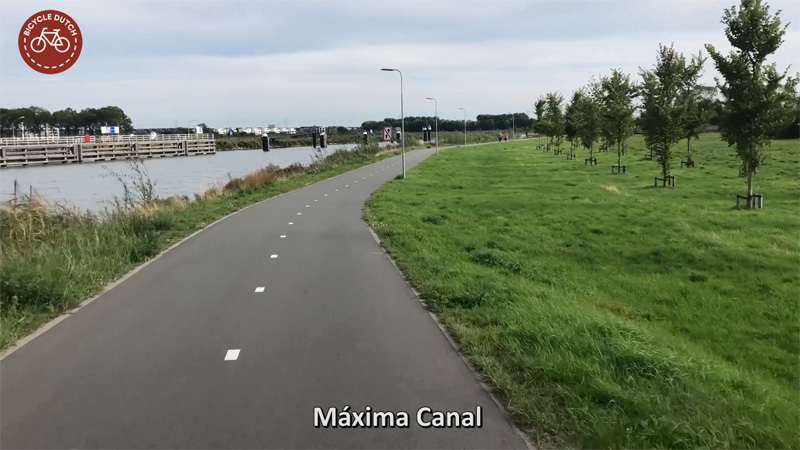 I have now finally cycled the full length of the cycle route alongside the Máxima Canal (opened in March 2015), the Zuid-Willemsvaart (a canal from 1825) that got a better cycle route alongside part of it in November 2015 and the connection between these two canals. This route, from ʼs-Hertogenbosch to Veghel, is 21 kilometres long. 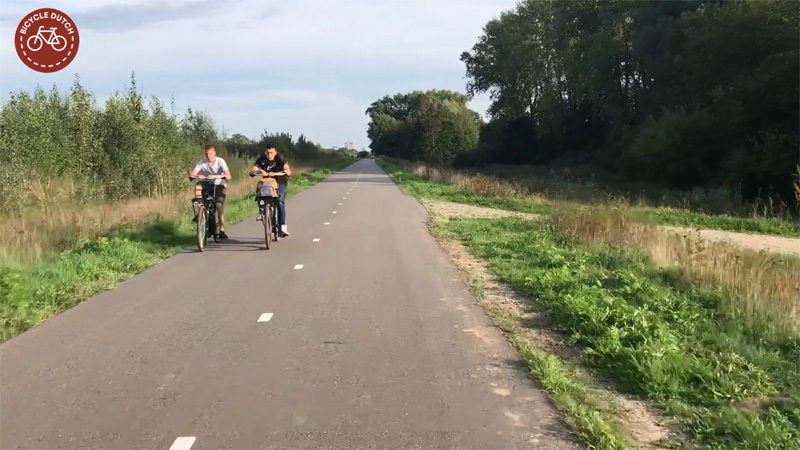 Most people cycle side by side in the Netherlands. Especially when cycling for recreation. I made this ride on a Sunday afternoon/early evening. So all the cycling at that time was recreational. 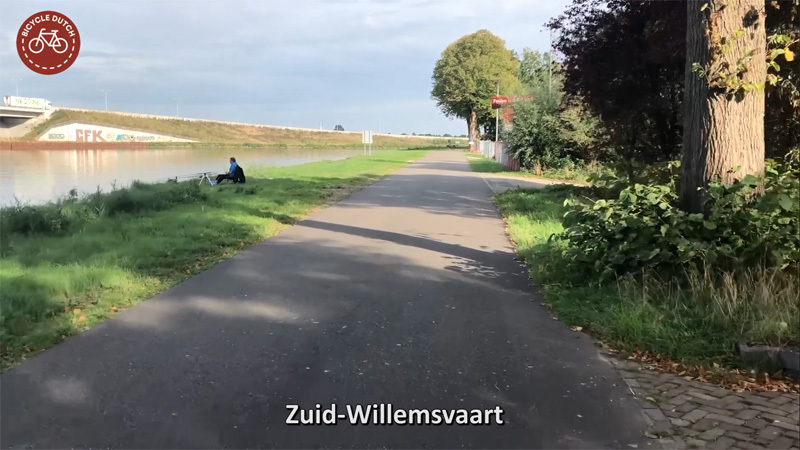 I had initially planned to only film the connecting route between the two canals. The existing two videos and this new third video could then show you the entire route. But I had filmed the two cycle routes alongside the canals in opposite directions. Combining the three videos in a playlist would therefore not be possible or at least make little sense. That is why I now cycled the full 21-kilometre route anew from north to south. The north-end of the Máxima Canal at the lock of Empel is where it connects to the river Maas (Meuse). The canal as well as the cycle route next to it were opened in 2015. 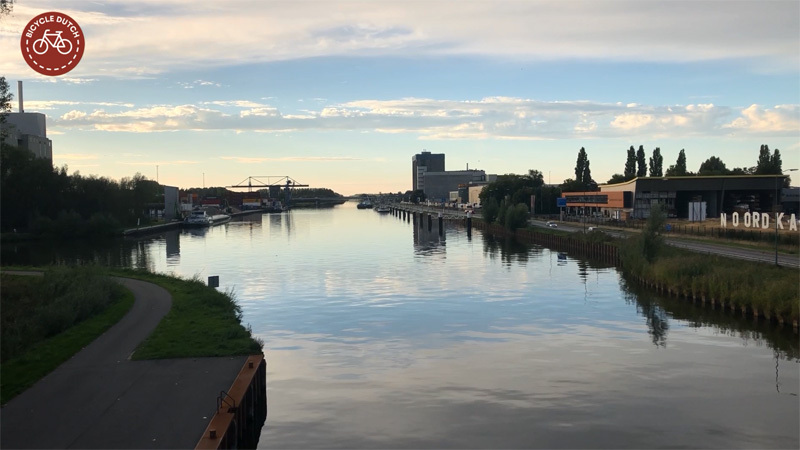 Starting where the Máxima Canal ends in the river Maas (Meuse), north of ʼs-Hertogenbosch, I cycle the full length of that 9-kilometre bypass for the part of Zuid-Willemsvaart that goes through the city centre of ʼs-Hertogenbosch to where the Máxima Canal starts. From there I follow the original Zuid-Willemsvaart to the town of Veghel where you can cross that canal on a cycle bridge, to get to the town centre of Veghel. When you compare these images with the ones I took in March 2015 you can see that the whole area is a lot greener now. Everything grew well in three years. Of course the trees are still relatively small, they take a lot longer. Most of the route is on dedicated cycling infrastructure. Sometimes cars are guest (alongside the Máxima Canal). 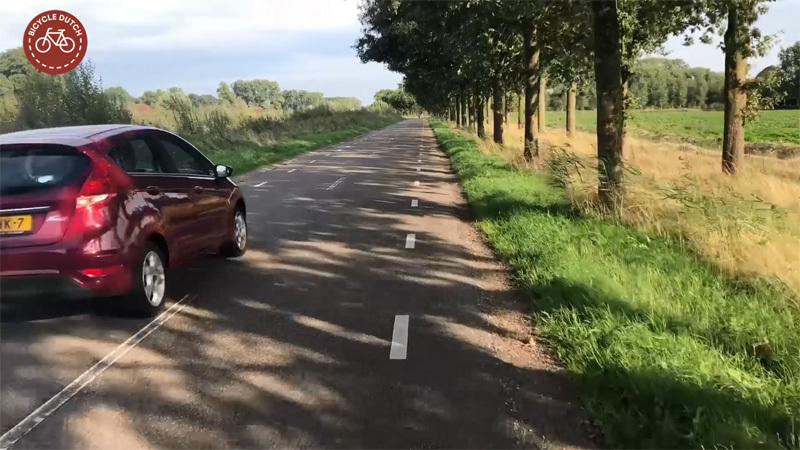 There is also a longer stretch of the route (about 4 kilometres) that uses regional roads (often dead-ends) with a low volume of car traffic and speed limits up to 60-kilometres per hour. The low traffic volume is reflected in the number of cars I encountered these 4 kilometres. Just 9 cars approached me from the opposite direction and only 2 drivers overtook me. 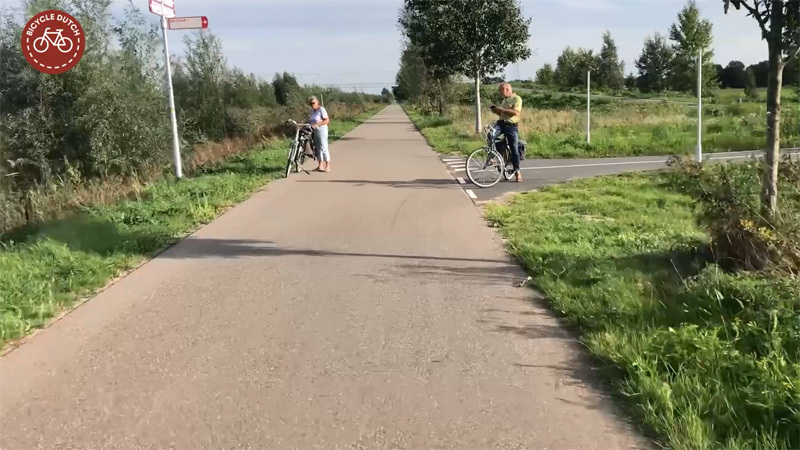 The connecting cycle route between the two canal routes takes people past an industrial area by the name of “De Brand”. There is no interaction with trucks in this area. Thanks to this cycle route on the outside. In the captions I explain some more of this route. There are two videos, one of the entire ride in real-time and one showing it in just 5 minutes. The N279 main road for motor traffic is not officially a motorway but it has all the characteristics. The cycle path crosses the exit ramp here. Very clear sight lines and the fact that drivers have to slow down make it possible to safely cross the one narrow lane. Motor traffic has priority. 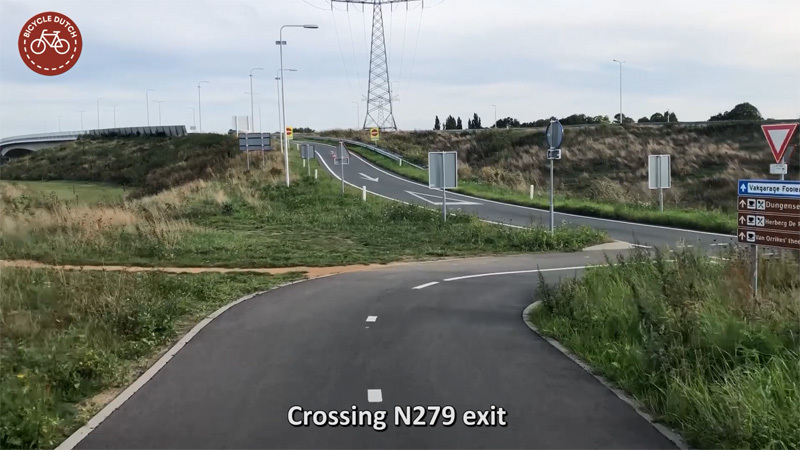 The main travel lanes of the N279 are crossed in this underpass. 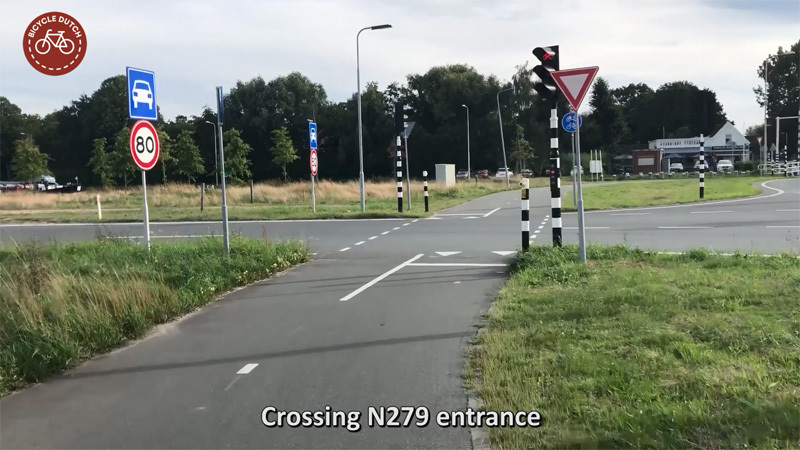 The crossing with the entrance ramp of the N279 is signal controlled. Cars are making speed here in two lanes. A crossing without signals would be too dangerous. This is one of the signals controlling the alternating flows of traffic across the narrow bridge at Den Dungen. Cars are taking turns to cross the bridge. 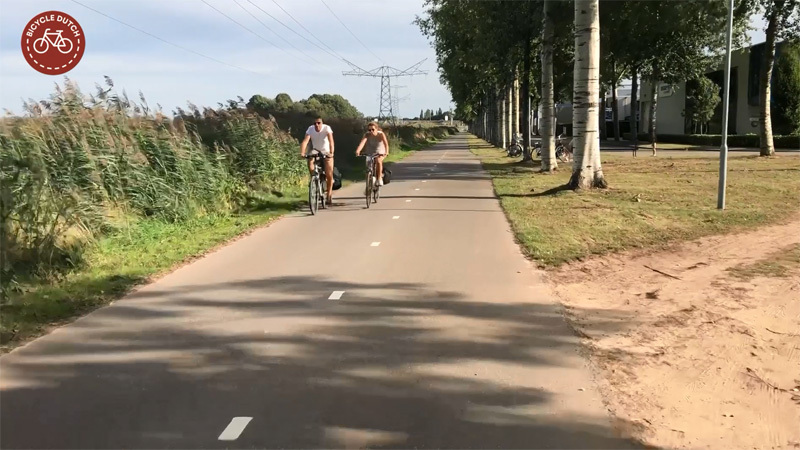 Cycling in two directions can take place when motor traffic in both directions is stopped. 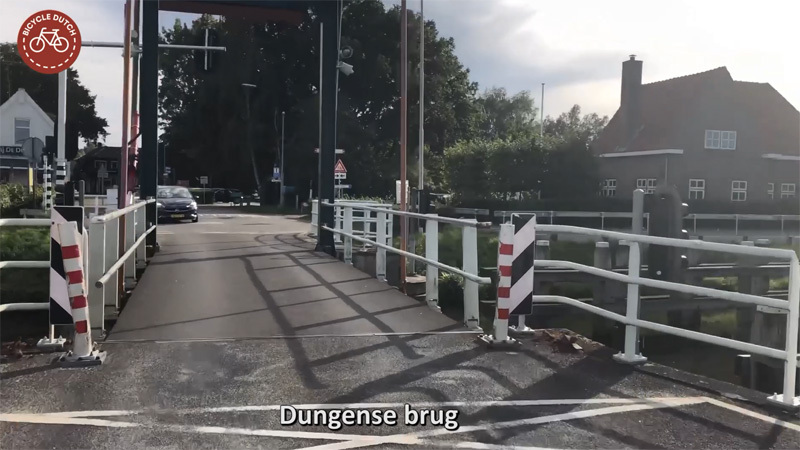 There is only one travel lane on the Dungense brug (Bridge of Den Dungen). Traffic has to take turns to cross this bridge. 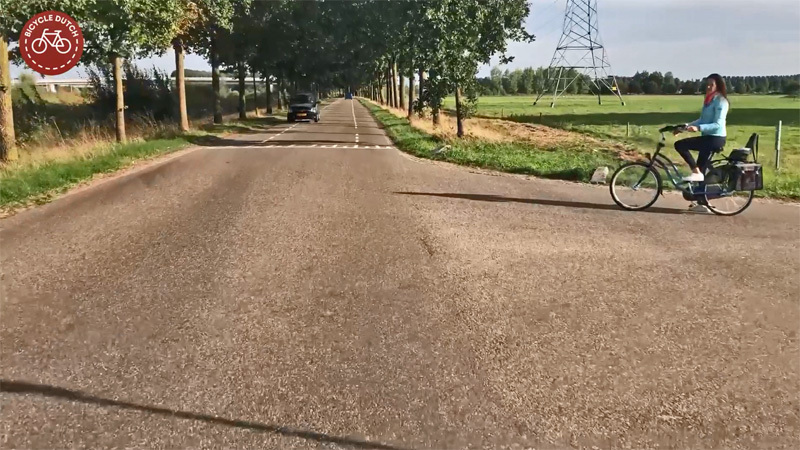 The car in the distance was stopped to allow cycling in both directions. On the left the start of Máxima Canal. From here the cycle route continues alongside Zuid-Willemsvaart, the canal that was opened in 1825. This used to be a maintenance road for the canal authority that was converted into a cycle route in 2015. The man on the right is checking where they need to go next on his smart phone. At this location a new cycle bridge was opened in December 2016. 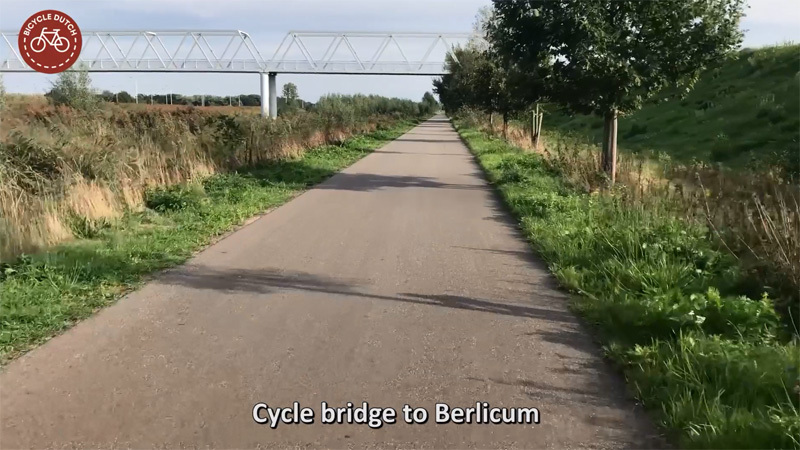 The bridge makes it possible to reach Berlicum from this side of the canal. See my blog post about this bridge. This is the part of the route on a regional minor road. The woman coming from the right would have the right of way over me. But she stopped to give the car coming from her right priority. That gave me the opportunity to cycle on. Only two cars passed me on the minor roads. This driver passes at a safe distance. The other car was a bit less correct. 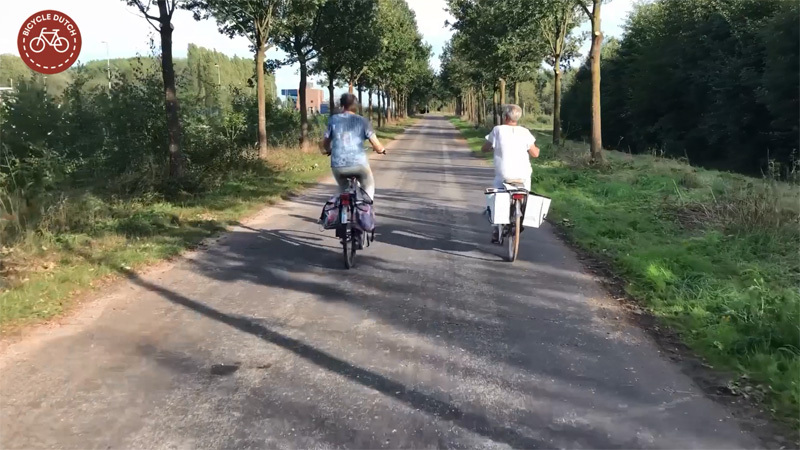 These two ladies cycle on a road that is a dead-end for motor traffic. It is clear they don’t expect many cars coming from behind them. They use the full width of the two-way road. They did give me room to overtake once they were aware I wanted to overtake them. 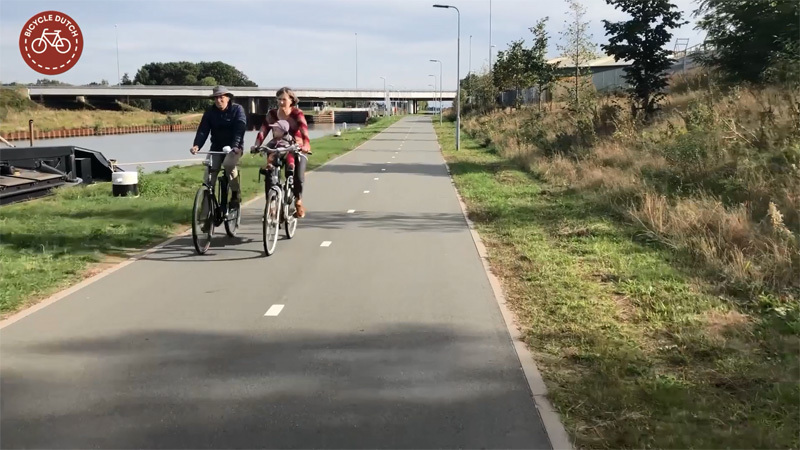 This is once again a cycle way. These two boys cycle in a very relaxed way and why wouldn’t they. 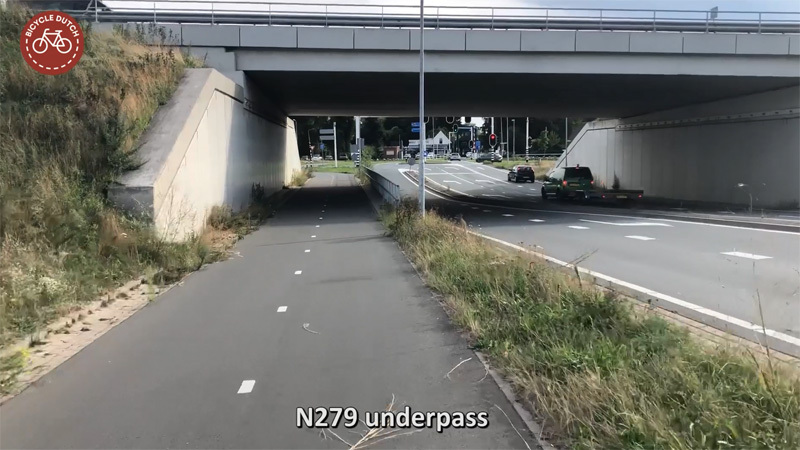 Close to Veghel there is this underpass to cross the A50 motorway from Eindhoven to Oss/Nijmegen and further north. 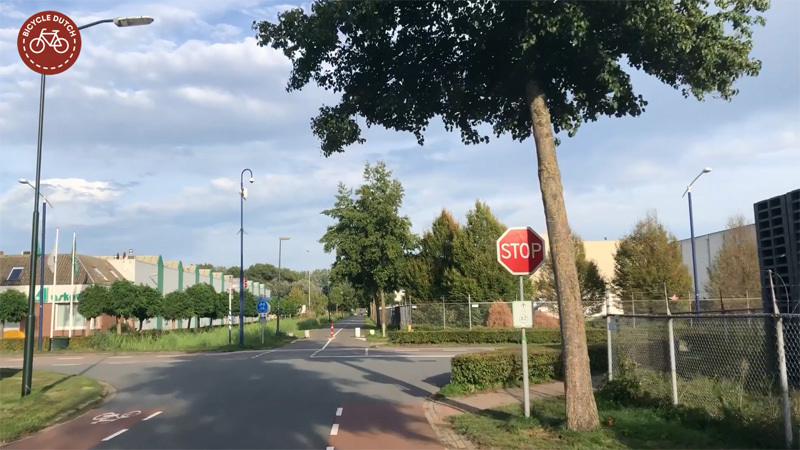 In Veghel I chose to cycle around the industrial area De Dubbelen, a slight detour but a safer and more comfortable route. 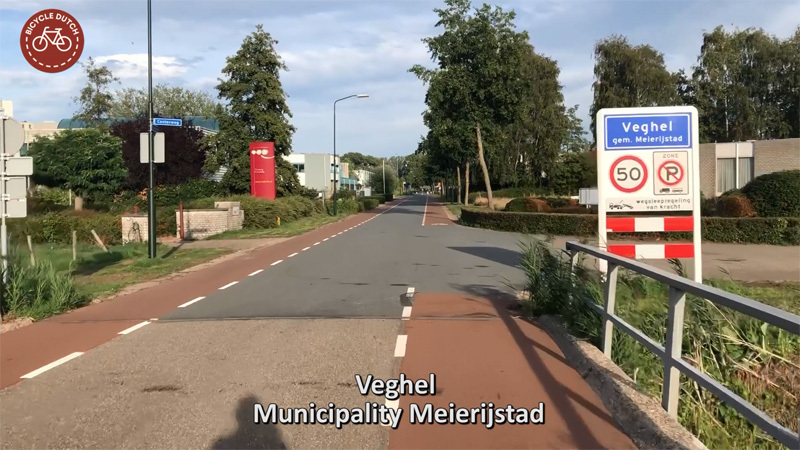 Entering Veghel (municipality of Meierijstad) on a 50km/h street with on-street cycle lanes. Which is only acceptable with low traffic volumes. Crossing a road in this industrial area. The sight lines are bad (especially for motor traffic) that is likely the reason for the stop sign. In the Netherlands you have already legally stopped on a bicycle when one of your toes touched the road surface. Needless to say you can do that without actually coming to a full standstill. That is exactly what I did here. 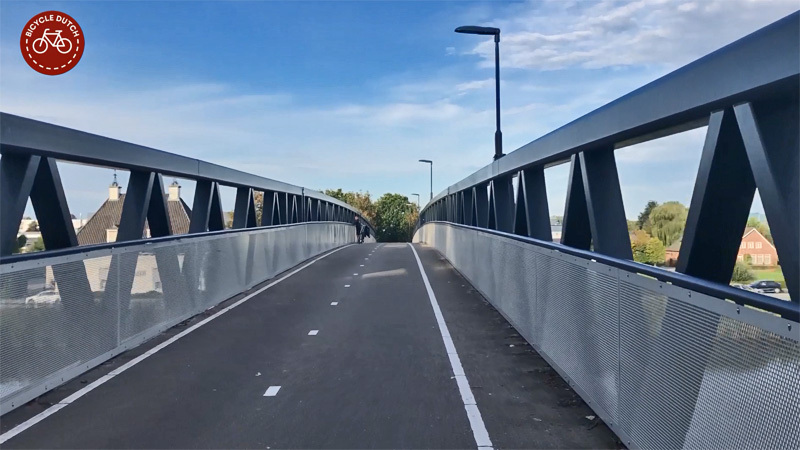 The cycle bridge over the Zuid-Willemsvaart in Veghel. Apparently the bridge in the Gazellepad (as the cycleway is called) is nameless. Looking north from the bridge of the previous picture in the direction from where I came. The ride in real-time, over one-hour-long. Why publish an hour long video? Well some people like to watch this way! The ride sped-up to just 5 minutes. Bicycling alongside of a canal might not seem like anything but it creates one of the most relaxed feelings I have ever felt. 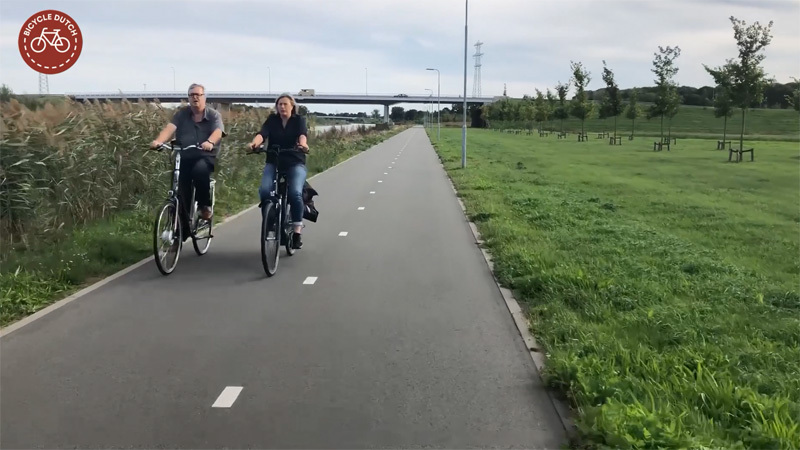 This summer I bicycled hundreds of kms along various canals on a heavy Dutch style bicycle that had me seated upright. I never thought I would live as good as that! Thanks Mark, I really like to watch long videos, there is so much to see! 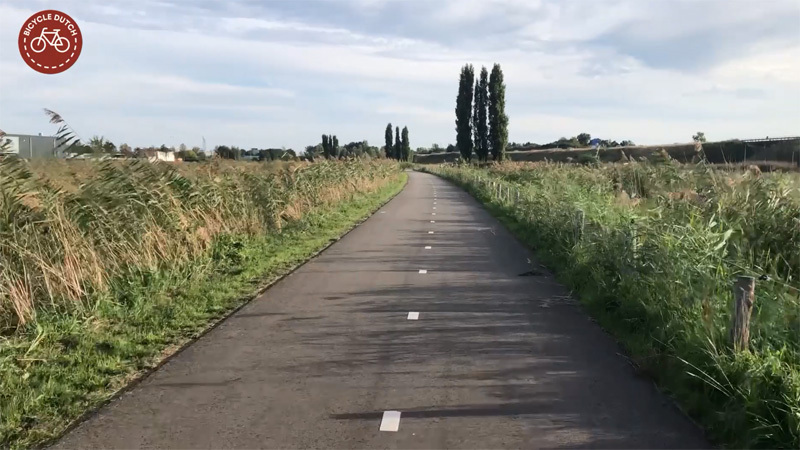 This entry was posted on 16 October 2018 by Bicycle Dutch in Original posts and tagged ’s-Hertogenbosch (Den Bosch), canal, long distance cycle paths, ride, Veghel.